I'm absolutely thrilled to announce the official opening of my new studio space. My husband and I have been working hard to make this space perfect for me and for you. It's great for newborn sessions, headshots, and indoor family sessions including maternity, babies and children. I can't thank him enough for making this possible. I absolutely love working here and so far clients love it too! Recently, my newsletter subcribers received a sneak peek at the new studio and learned all about my latest services and product offerings. They also received an exciting 'subscriber only' Summer Portrait Special to celebrate the opening of the new studio. To learn more about this special or future specials you can subscribe to my newsletter by clicking here. I'll send you a copy of my latest release in time to take advantage of this special offer. Summer is just around the corner and weekend availability is becoming limited. To book your session, contact me today or call me at 705-795-8574. Ask me about my new referral program that could earn you a free photo session. 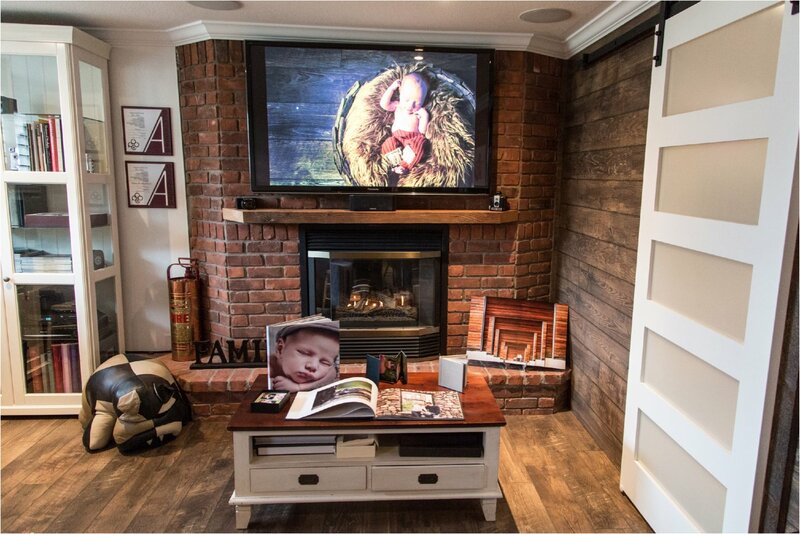 Beside my desk space I have an area dedicated to consultations and private screenings where you can view your images on a large screen... the way they're meant to be seen for the first time. All of my samples are on display for you to see and touch. I offer professional prints, canvas wraps, heirloom albums, wall displays and more. 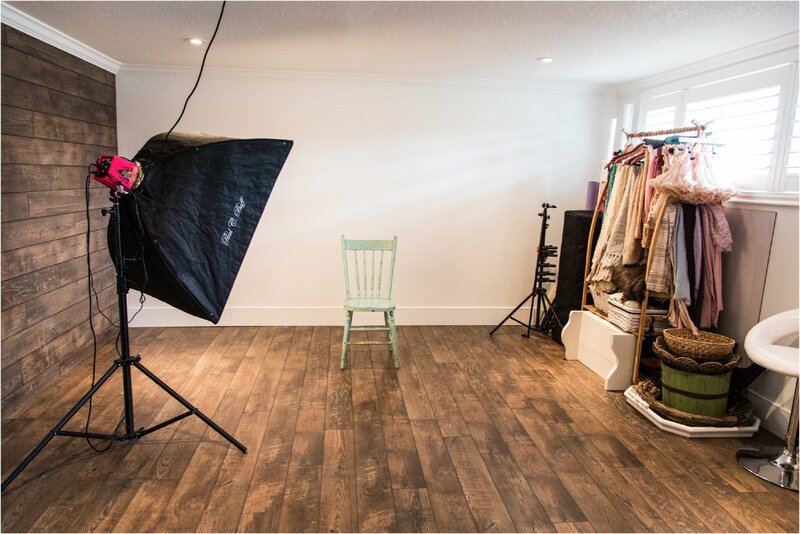 There is plenty of room for multiple lighting set ups and flexibility for multiple backdrops including a permanent rustic wood wall and floor. There is ample prop storage and tasteful accessories are just an arms reach away. 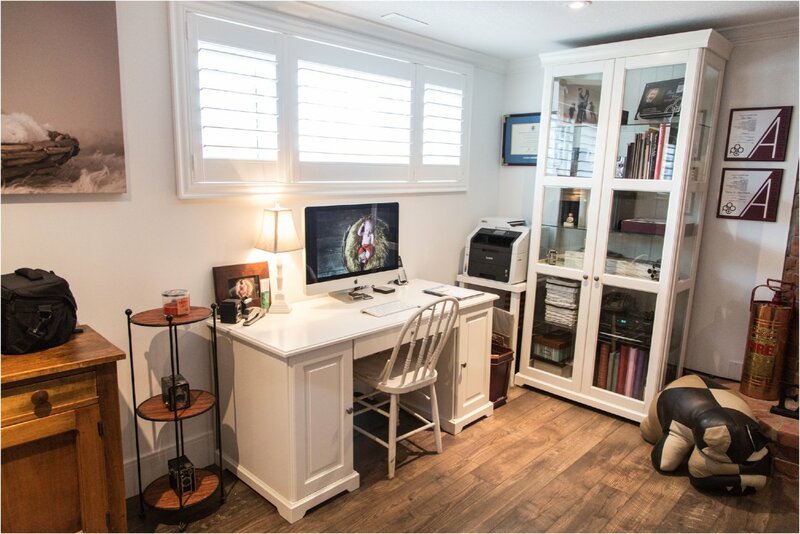 One of my favourite parts of this space is the little "cottage" playroom. It's expertly trimmed with shelves of toys and a children's movie centre - perfect for entertaining little ones who are waiting their turn to be photographed (or it can stay hidden behind a sliding door). What do you think of my new space? I'd love to hear your comments below. My studio is a dedicated space in my home which would make renting it out difficult at this point. Thank you for your interest! Sandra Carr - Do you rent your space out at all to other photographers? Liisa Sefton - Thank you so much Meaghan! Liisa Sefton - Thanks Mom! Liisa Sefton - Thanks Lisa! Liisa Sefton - Thanks so much Leanne & Ryan!! Lisa - Liisa this is absolutely gorgeous!! Love it. LeAnne - it looks amazing! Ryan & I wish you the most success, you deserve it! Mom - Amazing, Liisa and Scott! Meaghan Kennedy - Looks absolutely amazing Liisa!! 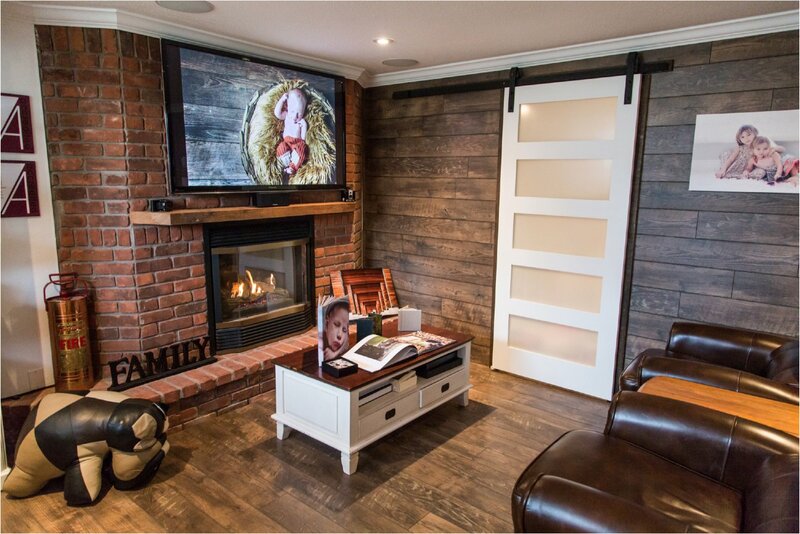 The space is beautiful and your clients will love it!! Great job!